Obviously you already know that I love this dining room. 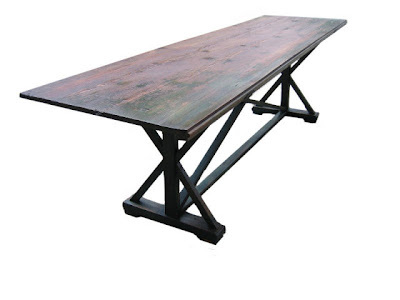 But I don't love a trestle table. To me it just screams "new" and to that end looks a little cheap (sorry). However it seems to be the standard design for a farm table these days. Or you can go more contemporary with a chunkier leg, like the Sundance Longmont table (top) or the Crate and Barrel Big Sur table (bottom). They're about the same price. So what am I doing? 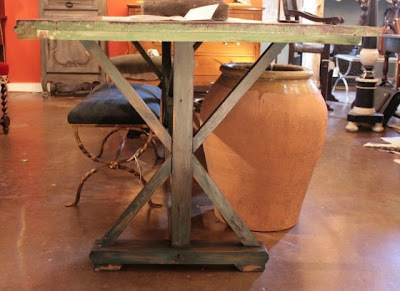 Having the table custom-made of course, by one of my favorite dealers from Brimfield. The dealer, Country Squire Antiques, is in Seekonk, MA (although supposedly relocating their workshop to Fall River) and had an amazing selection of 19th century furniture when I first met them. Bob, the owner, showed me many photos of his custom work and I felt confident he could make something for me. 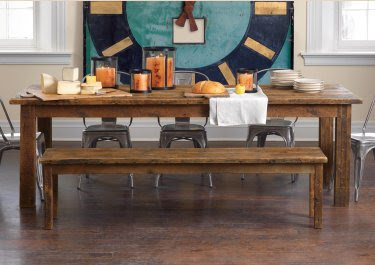 So I pulled out some photos that I had seen of an Italian farmhouse table sold at auction and sent them to Bob... if you look carefully, it looks like the table is one half of a pair (note the notched side on the right). Probably it was an old refectory table. 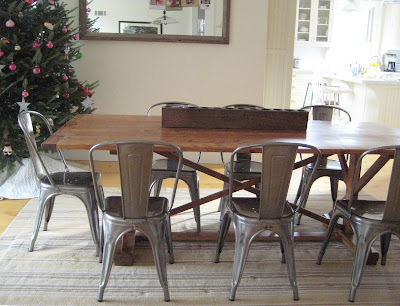 I also sent him a photo of the finish I was looking for - a weathered, well-loved reclaimed pine. The table is supposed to be finished by the end of the month... stay tuned! I had a rough day today. But I thought about my Dad's dahlia garden and that made me happy. Aren't they beautiful? Have you heard of the German catalogue Manufactum? I used to receive it at Pottery Barn. It was a J. Peterman meets Ace Hardware newsprint catalogue that belied the treasures they actually sell. You can look at all of their quirky collection online - they have fabulous industrial lighting, garden tools and home goods with a vintage feel. After relocating I didn't carry my subscription with me, so I rediscovered Manufactum when reading Domino's Renovator Diary. 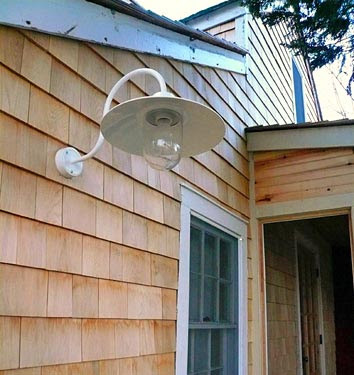 Here Brooke Williams shows off her Bolich outdoor light fixture. 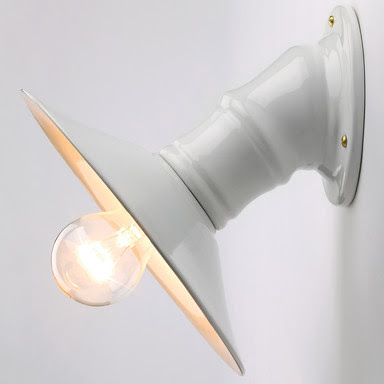 I raced over to the site to see if they might have some farmhouse-worthy lighting. To my delight they carried several items from Ceramiche Fabbro, a ceramics company in Italy. 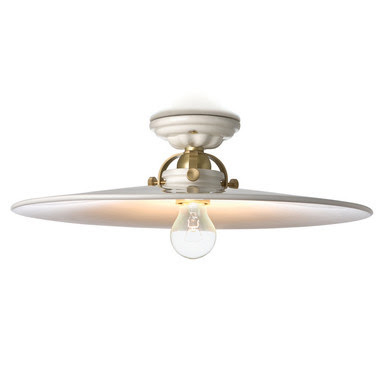 I immediately ordered 3 sconces and 3 flush-mount ceiling fixtures. I was ready to order AND deal with the exchange rate (remember this is Germany). How hard could it be? Problem #2: All the wiring instructions are in German. This is not so easy to maneuver because there are different codes for European banks than American banks. Fortunately my Bank of America had an Italian (as in from Italy) banker who could read German and understood European banking. Problem #3: If you don't receive the products, they aren't on a credit card so you can't stop the carge. Or if you don't like the products, you have a small window to return them, and shipping back to Germany is no small feat. Fortunately, we were dealing with the Germans and it was all very efficient. After 2 weeks I called Manufactum and a lovely English-speaking customer service agent looked up my order and informed me that it had shipped. One week later my 6 lights arrived, packed pristenely and as gorgeous as they are on the website! The biggest bonus of all???? I did not have to rewire them for American electrical standards. I took them to a lamp shop, but they were ready to go. I had thought they would all need to be rewired! What a thrill! So consider this Manufactum 101. If you can wade through the paperwork, their products are unique, affordable and really high quality - and likely no one on your street has 'em. Fall makes me think of New York and the years I spent there post-college working in advertising, living in the Village. My last job in NYC was at a fashion agency in Soho - such an inspiring, pulsating place to be. 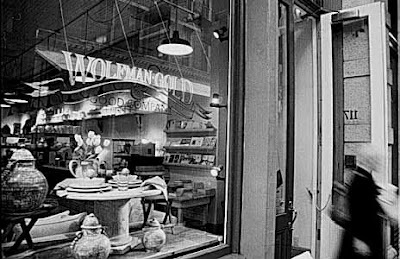 I still mourn the closing of the best-ever interiors store (in NYC, natch), Wolfman-Gold and Good which was on Mercer Street. 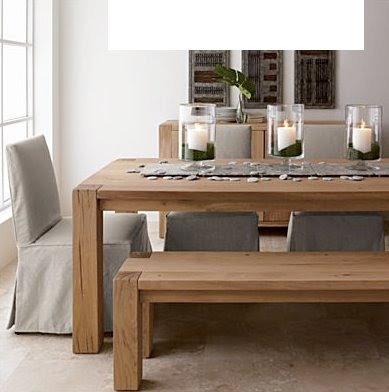 The store closed in 1999 when Peri Wolfman, one of the founders (her husband Charles Good started it with her) was lured away by Williams Sonoma to create their tabletop collection. Sigh. I know the lure of WS, that's for sure. Wolfman-Gold and Good was in a soaring space with glowing wide-plank floors, industrial lighting and piles of delicious, gleaming ironstone. Before Martha and Ralph did ironstone. I found a few interior photos (they really don't do the store justice, you just don't get the sense of vast space... but who had a digital camera in 1995? ), courtesy of one of their store display companies, Archatrive. I bought my first white sofa there, a slipcovered delight from Mitchell Gold. It was truly an amazing retail space with a carefully selected collection of special, beautiful merchandise. I only wish that I could pop in there for ideas, inspiration and shopping now that I own my own house. Famous for their ironstone... don't miss the copper collection up top! Here's to New York in the fall... and to those of you who miss Wolfman-Gold and Good as much as I do. Today is all about fall... we went down to Rhode Island and helped my dad gather apples from his trees. 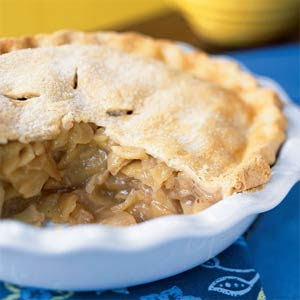 The leaves are changing, the air is crisp - I was inspired to make an apple pie. Of course I had to try the Barefoot Contessa's recipe, as I am on the hunt to find a recipe of hers that doesn't work (incidentally I haven't found one yet, and I have all of her cookbooks). 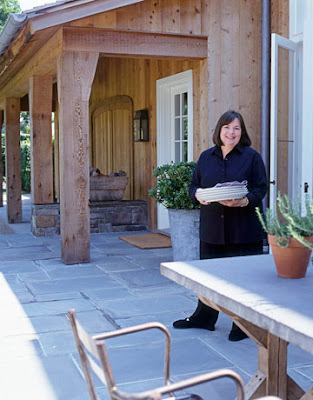 Which leads me to this - I really really love Ina Garten. I want to meet her. She just seems like a warm, genuine, REAL person. She dedicates all her books to her husband. She loves her friends, good food and a welcoming home (that shingle style farmhouse... take me now). 1. Cashmere blankets and Loro Piana slippers everywhere. 2. Great dance music when I'm cooking. 3. Flower arrangements from the garden. 4. Mariage Frères tea with homemade cookies. 5. Surrounding myself with people who make me happy. I mean, who says things like #5???? I suppose we all should, more often. This is why she is so fabulous. 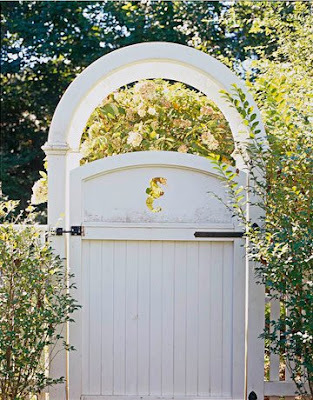 As for decorating, she has an exquisite shingle style house in East Hampton. I wish I could find a photo... but alas. 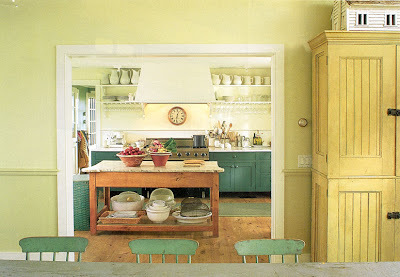 This is from her dining room, circa 1993 Martha Stewart (via Apartment Therapy). As you might imagine, I love her wicker chairs. "Personal details are important. How many times have you seen a gorgeous house in a shelter magazine that looks absolutely soulless? Everything's right but it's really not. That's because everything matches perfectly and the designer didn't incorporate the client's personal style--or any of those messy real things that people acquire." THREE trips to the paint store today. Fortunately it happens to be next to the fire station. A great detour for a 20 month old. 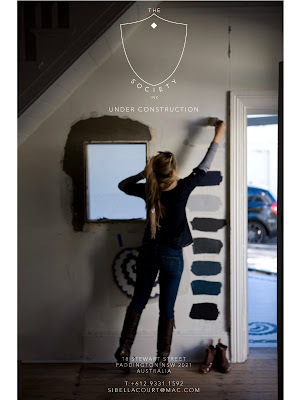 I love some of the color choices in this house that was featured in House Beautiful. 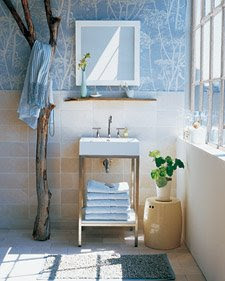 It is a very happy house, and combines white with refreshing pops of color. 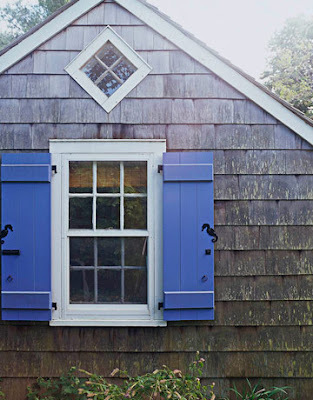 As I pore over fan decks and slap down another $15/quart for a Benjamin Moore tester, I am always drawn to the breezy summer beach cottages in my files. And here the homeowner got a little crazy!!!!! 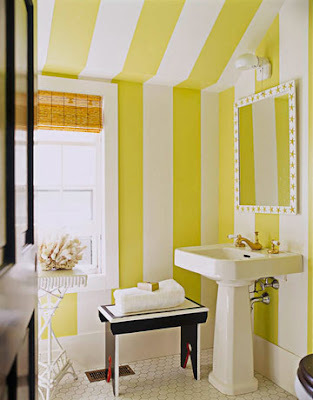 This bathroom is so fun (Apple Green and Decorator's White, Benjamin Moore). 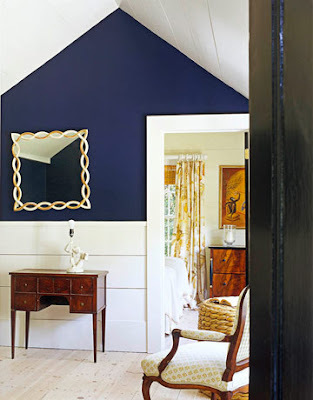 The navy is dramatic, and it would be interesting to see how the rooms transition with such a bold hit of color. I think about how you flow from space to space a lot, and while I love this navy, I can't quite figure out the flow. I love the combination of cool aqua and the red pop on the quilt (Wall color is Spring Mint and trim is Light Touch, Benjamin Moore). And who doesn't love a Christopher Spitzmiller lamp? Like a big, juicy jelly bean. 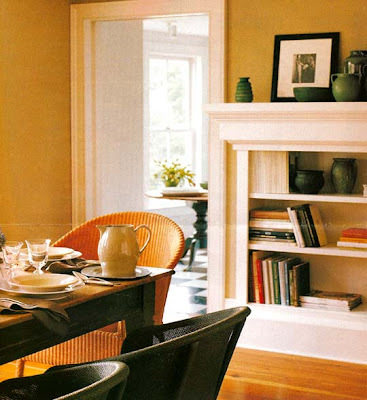 The dining room is probably closest tonally to what I will have in our farmhouse. The warm cream is so necessary to warm up the space, particularly when we are digging out of 30 inches of snow. This house is not a beach house, so I have had to revisit my color schemes. The colors can't be as clear or carefree. That doesn't mean they're darker, but they are a bit more complex. Stay tuned for the choices and the photos!!!!!!! I am posting a photo of the outside of the house so you can really get some perspective on the discrepancy of architectural styles (I hate to say it, but SHAME Gary Wolf, I don't care how famous you are). 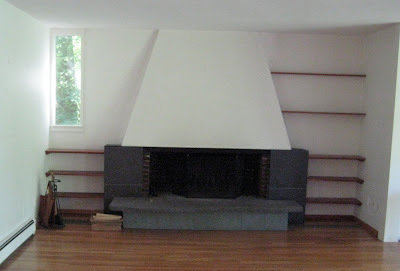 One of the things that I really hated about this house was the fireplace. It personified everything about the modern renovation in 1995 that I hated and that was not in keeping with the historical architecture of the house - the asymmetry, the huge black slate tiles and particularly the trapezoid top. I mean, TRAPEZOID? When I think "favorite shape" (ok, I don't think about that often, but whatever), I don't think TRAPEZOID. The sadness of that little window. The greater tragedy of the balsa wood shelves. Something had to be done... trying to work with the slate tile, our architect designed something that somehow made the tile look even worse. I had the builder take it down immediately. And then last week I got brave enough to start hacking at that tile. Ah. But I still didn't know what I wanted to do with it, I didn't want to call in our architect again and the builder was saying "you have to make a decision NOW." 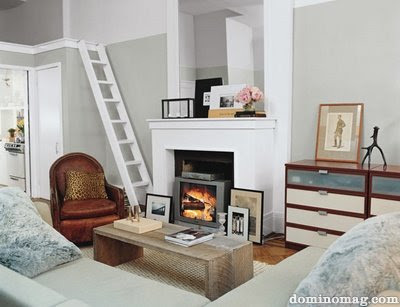 So I looked at fireplace images at Domino and Martha Stewart... this one in particular caught my eye. I thought it blended traditional and contemporary well. and they started building today! Doesn't it look a MILLION times better? I can't wait to show you when it's painted and the crown molding is put up. Oh, and don't forget our windows. Opens up the whole space and actually inspires you to sit down, as opposed to running screaming from the tragic TRAPEZOID. It's fall in Concord... isn't it breathtaking? The left photo is the carefully pruned maple by our garage. The right photo is looking out to the Minute Man Park (for those of you who forgot 11th grade history... it's where the opening battle of the Revolutionary War occurred and it is absolutely gorgeous, peaceful and down-in-your-soul restorative all year round). Well things are happening... the cabinets by Crown Point are going in. And they're gorgeous. GORGEOUS. I was worried about the paint color but it's perfect. The tile is almost done (it's a handmade subway tile glazed aqua by Pratt and Larson). Poor Roger... I made him take it all down because it wasn't perfect. And now, strip by strip, he is putting it back up. He is from Florida and the bathroom is cold, so cold tile, wet saw and no heat are taking their toll. But doesn't it look beautiful? I am so glad I went with something cool and dramatic. The de-leaded front doors... ready to be repainted (and loving that there is a doorknob and a lock again). See that big round brass thing? That's the original doorbell. You turn a key on the outside and it rings. Fabulous. 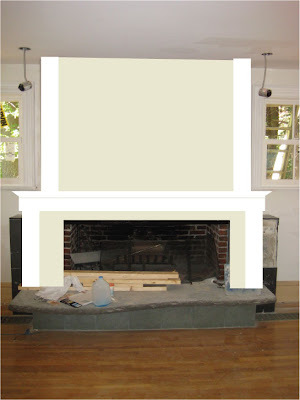 Stay tuned for my update on the fireplace! 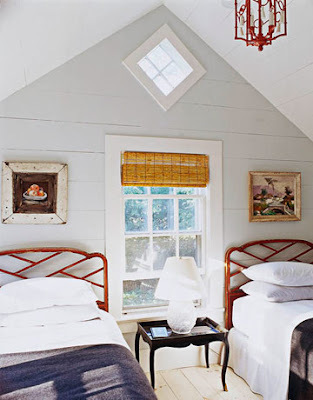 This house used to feel so cold, with grey-tinged white walls (and some grey walls) and no molding. After putting in the gorgeous, sunny wide-plank Carlisle floors, miles of special crown molding and now the creamy kitchen cabinets, things are starting to warm up! 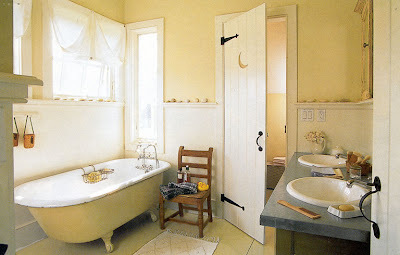 I am leaning towards creamy paints and yellow tones, especially in the north-facing exposures. The powder room on the first floor is VERY small (about 5.5 x 3.5), and is going to be dominated by a cast-iron utility sink (photos on that later). I'd like a yellow-toned wallpaper for this teeny weeny space, preferably with an organic theme. 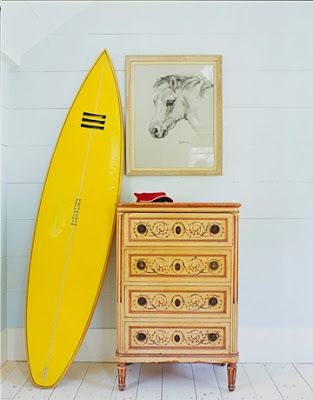 And it's just off the mudroom, so it needs to flow with that - think creamy paint and beadboard. 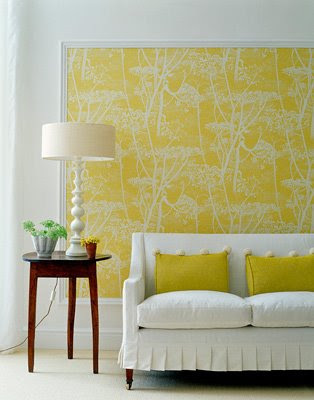 This paper - Cow Parsley by Cole and Sons - is currently in the lead. The above tear is from Real Simple, but it was also featured in a recent Martha Stewart in blue. I have searched Etsy and Ebay for vintage rolls (as well as the usual suspects like Secondhand Rose). 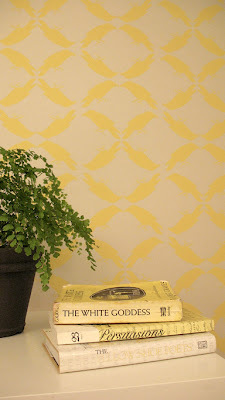 I found this fun vinyl lattice print on Etsy... but there is only 1 roll (72 sq feet). Not enough! 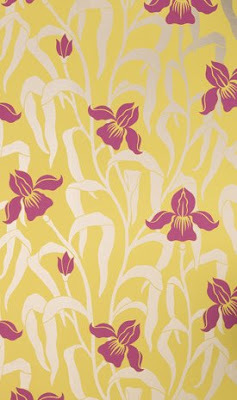 A little more glam would be this fun print from Osborne and Little, Iris, from their Vintage II collection. 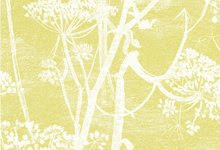 Whose heart wouldn't be aflutter with this adorable paper from Alpha Workshops? 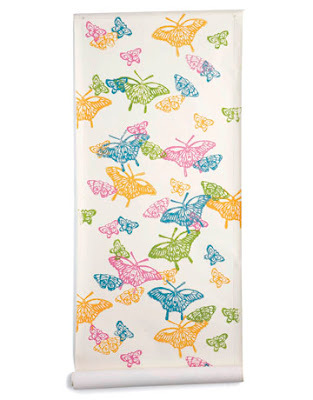 Butterfly in Jubilant colorway. 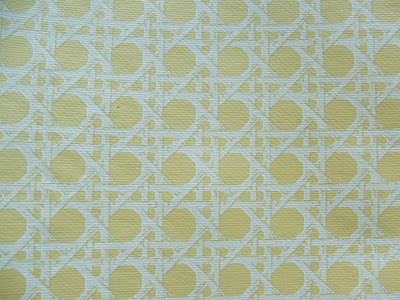 And while it doesn't look great on the web, I do love this paper - Erin by Madison and Grow in the roll-off-the-tonque colorway of Jonquil on Parchment. 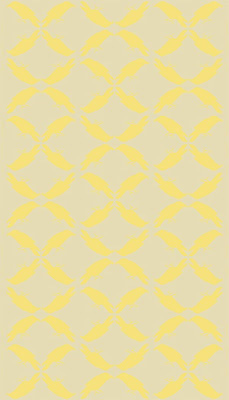 The subtle bird motif is playful yet modern. 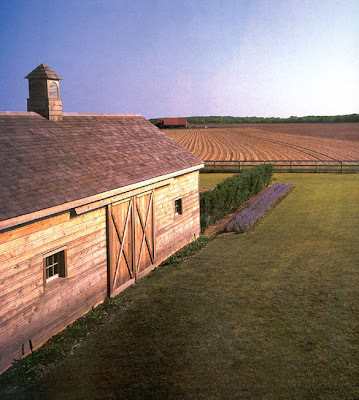 For a farmhouse, what say you?? ?